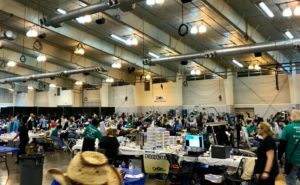 Dr. Albers at COMOM 2018 - Mark T. Albers, D.D.S. 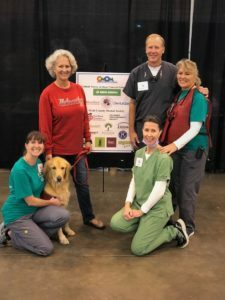 This year, Dr. Albers, assistant Susan, hygienist Jane, and front desk guru, Michele volunteered at COMOM 2018. Susan assisted Dr. Albers. Hygiene section lead, Jane, helped ensure the smooth flow of patients and otherwise helped trouble shoot problem areas. Michele helped in triage – where patients are assessed for dental health needs. 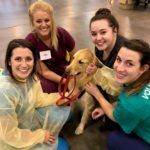 Last year, Carla approached COMOM about using therapy dogs to help distract patients and provide some much-needed love and affection during long waits for care. She and Indy acted as a test case at COMOM 2017 in Pueblo, CO. Indy was such a hit that they asked for more Go Team dog/handler teams this year. On Friday, four teams provided some much needed “therapy,” and on Saturday, 5 teams were there. 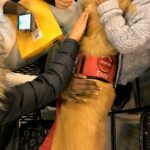 Although a primary focus is always on the patients, it turns out that the dogs provided a lift to volunteers putting in long hours helping others.